Williams, son of former All Black Bryan Williams, enjoyed a successful but nomadic existence in New Zealand rugby, adding his class to the back-threes of the Crusaders, Blues and Highlanders during his Super Rugby career. In 2009 he won the NPC with Canterbury before again heading to Auckland and the Blues. In 2010 he joined his brother, Clermont Auvergne centre Gavin, in declaring for Samoa and made his Test debut during the Pacific Nations Cup. 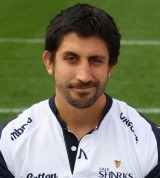 He was recruited by Sale Sharks head coach Mike Brewer later in 2010.